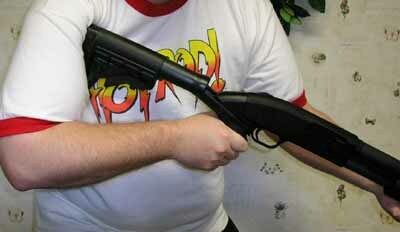 Around Christmas I was able to finagle myself a new shotgun for home defense: a Mossberg 500 12-gauge pump-action shotgun. Not being very experienced with shotguns, I thought it a good buy at $279 brand-new. And it was. However, right out of the box it had a couple ticks that became apparent, such as force of recoil and reach. Shooting the thing really punished my shoulder, and using the pistol grip that came with it felt like it was breaking my hand. The stock also felt a little long for me, as my arms aren’t anything to write home about concerning length. I made a trip to a local gunshop/outfitter for a general window-browse. After some casual-looking and conversation about various things (the scarcity of .380 rounds, my mother’s interest in a CC gun with a laser grip, my interest in a Judge .45LC/.410 shotshell revolver or hi-cap plastic pistol, and getting to check out a Walther P-38/real-life Megatron), I asked about a new stock for the shotgun after seeing a Mossberg rifle with a pistol-stock combo. So after some digging around the innerweb the store owner and I cued in on a stock that looks similar to what you might find on an AR-15 (the semi-auto civilian model of the U.S. military’s M-16). So, the good sir put in the order, and I picked it up today…a Blackhawk Spec-Ops stock with recoil suppression springs built-in (current offering is somewhat different in grip design). It wasn’t cheap…over a third of the original cost of the gun! But it’s got adjustable length, fits right into the existing weapon, and looks pretty bad-news. So, as soon as I got home today, guess what my first project was? Being that I also should have picked up some shells while at the shop today, I’m not really in a position to do a lot of test shooting to see how it works. But I did fire off a few shots, and I’m already very happy with how things are going at this point. Now, maybe I’m a weinie for getting something to reduce a 12-gauge’s recoil, but my shoulder feels a lot better than it normally would, and it doesn’t raise up and kick like a mule nearly as bad anymore.